Since the last State Championship, stunt has been long awaited, and with spring sports starting up, it is finally here. Stunt is a fairly new sport derived from cheer. 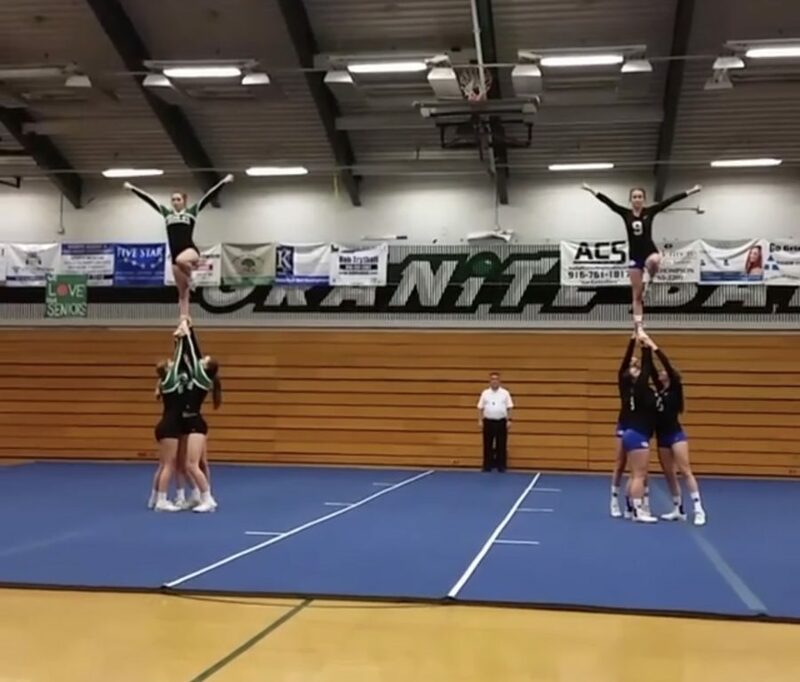 It takes the technical and athletic elements of cheer, such as partner stunting, pyramids, jumps, tumbling and basket tosses, where they are put into short routines in which both teams perform head-to-head on the floor at the same time. Stunt consists of four quarters, the first being partner stunts, the second being pyramids and basket tosses, the third being jumps and tumbling and the fourth consisting of all the quarters combined into one routine. How the game works: both teams perform the same routines side-by-side on the floor. There are judges scoring both teams, and whichever team performs the routine more flawlessly wins that round. Stunt at Rocklin High School has only been around for the same amount of time the sport has been, which is about 5 years. There are a couple girls who have been there since the beginning and have seen it grow from a few teams participating to now 93 teams participating in California. These girls include Mackenzie Murphy, Gabby Houston, Abbey Connell and Lacey Richardson. Adding on, stunt has become an official CIF sport as of this year, meaning that it has become an official sport in the state of California. This means there will be an official championship game held, and the champion will be officially recorded by the CIF. With more teams competing, stunt becoming an official sport and Rocklin Stunt being off to a great start, this season is going to be something new and exciting.